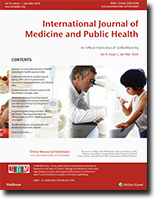 P. Sinha and Hochberg, N. Sarah, “Food for Thought: The Role of Undernutrition and Diabetes in India’s TB Epidemic”, International Journal of Medicine and Public Health, vol. 9, no. 1, pp. 1-3, 2019.